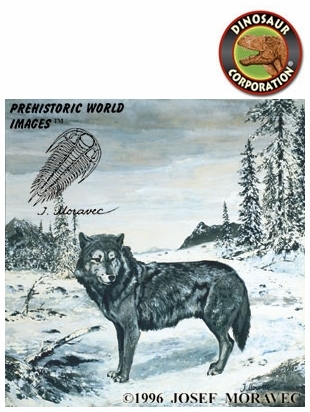 The Gray Wolf (Canis lupus) is a unique quality reproduction of original oil painting by paleo-artist Josef Moravec on HD Aluminum Metal Prints. Media: HD Aluminum metal prints are dynamic artistic prints where specialty dyes are fused into coated aluminum panels offering brilliant, long lasting and sustainable art preservation. We offer HD Aluminum Framed Metal Prints up to 40�x60� in size and do custom sizes. � Copyright Dinosaur Corporation, U.S.A. All rights reserved.